Any good tutoring company management system should allow you to grant user access to your clients and employees to give them the ability to access their information and schedules at any time. Teachworks supports 5 different types of user profiles and you can easily enable user accounts directly on each user’s profile. 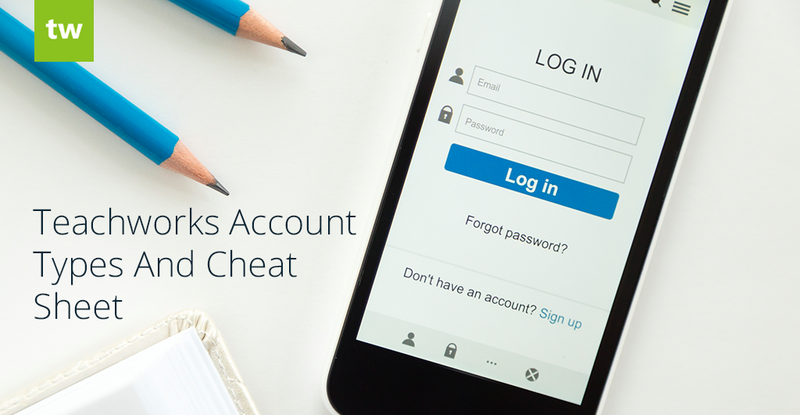 To enable user account access for your employees and clients, you can follow these steps: Enabling A User Account. This is the account that was created when you first signed up for Teachworks. The admin account has unrestricted access to everything in Teachworks and is the only account that can manage subscription settings and add staff accounts with permission to manage the company’s settings. If you have non-teaching staff, such as receptionists, bookkeepers and accountants. You can set the permissions for each staff account directly on the user’s profile to only give them access to information related to their roles. If you have teachers that also perform non-tutoring activities. If you’d like to add additional admins to your Teachworks account. 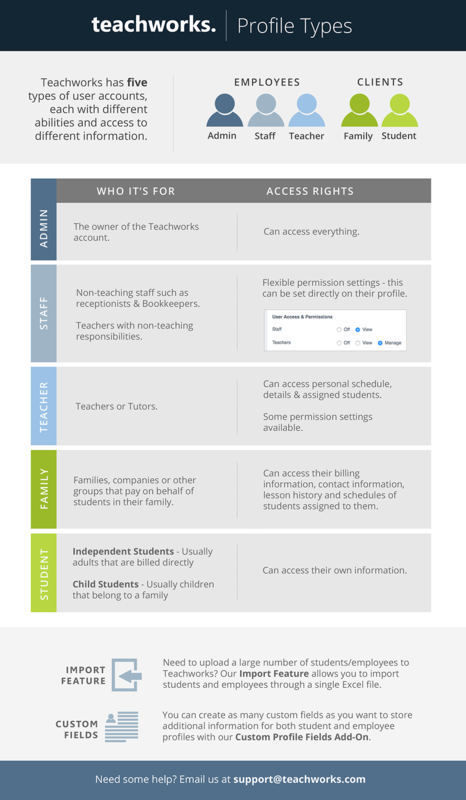 Staff accounts can be customized to access everything in Teachworks, but the admin account is the only account that can make changes to the subscription and add other staff accounts with permission to manage the company’s settings. Teacher accounts are for teachers, tutors, instructors (or any other employees that teach). There are a few permission settings that you can customize, but by default teacher accounts will have access to their own schedules, information and students assigned to them. Teacher accounts can be given the ability to: Add, edit and complete lessons for students assigned to them; view the lesson cost for lessons assigned to them; see calendar events for other teachers and more. Family accounts are for families, companies or any other groups that pay on behalf of the students in their family. These accounts have access to their own billing information as well as the contact information, lesson history and schedules of the child students assigned to them. Teachworks profiles come with all the standard fields you need, but if you’d like to gather additional information you can use our Custom Profile Fields Add-On to add more fields to profiles. These fields are for internal use only so will not be visible to your clients. If you need to upload a large number of students or employees to Teachworks, you can use our Import Feature. This feature allows you to enter the information for each user in an Excel template which can be uploaded to create records in Teachworks. Once you’ve uploaded the profiles, you can enable user accounts as needed. « Multiple Test Score Tracking And Other New Updates!